Exterior of a Saab GT850. Dashboard of a Saab GT850. Saab GT750 (Gran Turismo 750) is an automobile from Saab produced between 1958 and 1960. It was introduced at the New York International Auto Show in 1958 and featured safety belts as standard, which soon became commonplace on most cars. The GT750 was a sporty version of the Saab 93, mainly aimed at the US market. It had the same body shell as the 93 but used a different interior and a high-output Saab two-stroke engine. Rear-hinged doors were offered on the 1958 model year only. It was not retired from the market with the 93 but received the Saab 96 body and 4-speed gearbox in 1960 and continued in production until 1962. In 1962, it received the even larger engine from the 96, was fitted with front disc brakes and was renamed the GT850. It was called the Saab Sport in the UK and 'Monte Carlo' in the USA (after the successes in the Monte Carlo Rally). The GT had twin carburetors and the two-stroke engine had been tuned to develop 50 hp (37 kW). An optional tuning kit was available to upgrade it to a GT 750R with the engine power boosted to 55 hp (41 kW). The engine gave most power at high revs, 3400 to 5000 rpm. The gearbox had three gears. In order to overcome the problems of overrun for the two-stroke engine, a freewheel device was fitted. 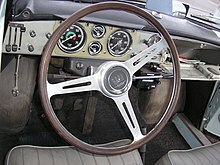 A 1959 review by Road & Track commented that smooth upshifts of the widely spaced 3-speed manual required revving the engine over 5000 rpm or slipping the clutch. Saab provided a retrofit kit which leaned out the fuel mixture in the carburettor, making the car more tractable at low revs but seriously impacting performance. The magazine also tried a modified GT with 57 hp (43 kW), which improved acceleration to 60 mph (97 km/h) from 15.2 seconds (in the 50 hp (37 kW) GT) to 12 flat. For comparison, an unmodified 93B required 27.2 seconds. Road & Track praised the car's smooth ride and steering, as well as its high level of equipment. Even a "Halda Speedpilot", a mechanical analog trip computer of the type used for rally racing, was included in the package. ^ "trollhättansaab.net". Trollhattansaab.net. Retrieved 2011-12-01. Wikimedia Commons has media related to Saab GT750.